Solar Panels are an excellent way to charge your electronic sonic bird repeller product. Charges a battery constantly, using the sun's power, so that electronic recharging is unnecessary. Solar Power Panel allows unattended operation of your bird repeller which saves time. Solar Power Panels convert sunlight into electricity. Wire conducts the electricity to batteries where it is stored until needed. Electricity is then used directly from batteries, to power DC (direct current) appliances like your repeller from Bird-X. The Standard Panel can be used with the BirdXPeller PRO and GooseBuster PRO and other single- speaker devices. **** Note: You must purchase a 12vDC battery in order to utilize the Solar Panel. The panel can only charge the battery: it cannot power the repeller directly. A deep cycle, marine type battery is recommeneded. BirdXCanada does not supply batteries. *Requires battery cable with alligator clips (not included in purchase). 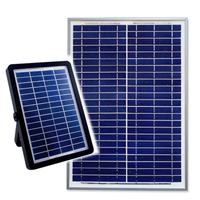 We have a limited number available for purchase, please inquire when ordering Solar Panel or purchase locally. *Requires 12volt DC battery (not Included in purchase). We do not carry these; purchase locally.